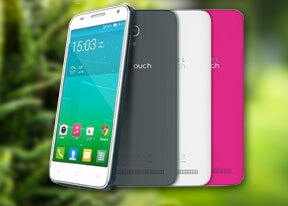 The last of the One Touch family of Android phones at the Alcatel booth is the little Pop Fit smartphone. However, it doesn't want to be just a smartphone, it wants to be a fitness wearable and is the right size to comfortably attach to your arm. This way it can track your steps, runs and workouts. Alcatel really wants fitness fans to like this phone and has thrown in an armband case for the Pop Fit. That's not all - the company also includes a pair of JBL smartphones into the bundle. This little fella isn't afraid to get sweaty because it's splash-proof and will be trendy for quite some time due to its translucent interchangeable back covers. There are a bunch of colors available including blue, dark blue, red, pink and yellow. Featuring a 2.8" display of QVGA resolution (320 x 240 pixels), the Alcatel One Touch Pop Fit packs a 1GHz MediaTek CPU, 512MB of RAM and 16GB/32GB of storage. Popping the back cover open reveals a 1,000mAh battery. The phone is the only one to feature a glossy plastic finish and you'll be right to think it's a fingerprint magnet. On the flip side, there isn't too much to wipe off, as it's a very small phone indeed. This means that it's not too easy to handle as it literally can get lost inside your hand. The small form factor means it's not expensive at all. In fact, Alcatel tells us it's going to start shipping in May at €89 unsubsidized.